I KNOW NOW HOW DEVOTED YOU ARE TO GOD, SINCE YOU DID NOT WITHHOLD FROM ME YOUR OWN BELOVED SON. As we continue our lenten journey toward the cross, we are asked to ponder God's unfathomable love for us, so great that he did not withhold from us his own beloved son. In our first reading (Genesis 22:1-2, 9-13, 15-18), we hear to vivid story of Abraham as he freely offers "his only son Isaac, whom he loves," as a holocaust to God. Even though complying with God's request would have meant an end to God's promise for "descendants as countless as the stars", he did not question. His love for God was greater than all else. We see in Abraham's absolute trust in God as a model for us. God put Abraham to the test. He called to him, "Abraham!" "Here I am!" he replied. Then God said: "Take your son Isaac, your only one, whom you love, and go to the land of Moriah. There you shall offer him up as a holocaust on a height that I will point out to you." When they came to the place of which God had told him, Abraham built an altar there and arranged the wood on it. Then he reached out and took the knife to slaughter his son. 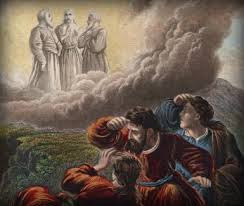 But the LORD's messenger called to him from heaven, "Abraham, Abraham!" "Here I am!" he answered. "Do not lay your hand on the boy," said the messenger. "Do not do the least thing to him. I know now how devoted you are to God, since you did not withhold from me your own beloved son." As Abraham looked about, he spied a ram caught by its horns in the thicket. So he went and took the ram and offered it up as a holocaust in place of his son. Again the LORD's messenger called to Abraham from heaven and said: "I swear by myself, declares the LORD, that because you acted as you did in not withholding from me your beloved son, I will bless you abundantly and make your descendants as countless as the stars of the sky and the sands of the seashore; your descendants shall take possession of the gates of their enemies, and in your descendants all the nations of the earth shall find blessing-all this because you obeyed my command." In our Gospel reading (Mark 9:2-10), we hear of the Transfiguration of Jesus on a high mountain. There are many elements of this story that directly link Jesus to the Law and the Prophets of the Old Testament. In it, Jesus is revealed in all his divine glory. This takes place shortly before Jesus passion and death - from divine glory to the agony of crucifixion. At the conclusion of this scene, we hear the voice of God saying, "This is my beloved son. Listen to him." As they were coming down from the mountain, he charged them not to relate what they had seen to anyone, except when the Son of Man had risen from the dead. So they kept the matter to themselves, questioning what rising from the dead meant. In our Epistle reading (Romans 8:31-34), St. Paul reassures his Christian audience that, even in the midst of relentless persecution, they can be no less glorified in their suffering than God's own son, whom God "handed over for us all". Brothers and sisters: If God is for us, who can be against us? He who did not spare his own Son but handed him over for us all, how will he not also give us everything else along with him? Who will bring a charge against God's chosen ones? It is God who acquits us, who will condemn? Christ Jesus it is who died-or, rather, was raised - who also is at the right hand of God, who indeed intercedes for us. One of the things we learn today is that God's call is personal and demanding. It is not always easy. We follow in the footsteps of God's own son. But we know where those footsteps lead. Beyond the suffering, beyond the hardships, beyond even death, we know God's unfathomable love for us will transcend it all. "It is God who acquits us, who will condemn?" When God calls to us, how should we respond? As Abraham, "Here I am."